Darksiders II, one of the first games confirmed to be making its way to the Wii U at launch will not have multiplayer features due to technical difficulties. 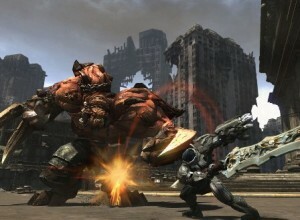 Vigil Games had been considering multiplayer for Darksiders II but technical hurdles got in the way. I can understand, the time and resources used on making each character could be used to make the rest of the game better. I can’t imagine a game like Darksiders II with multiplayer anyway. The story and gameplay design looks like it was specifically designed to be played solo, like the Devil May Cry or the God of War series. the only thing worse than eating dog dirt or child abuse IS TACKED ON FOR NO REASON ONLINE AND MULTI-PLAY its that bad..
Didn’t expect they would. Not everything needs multiplayer, after all.